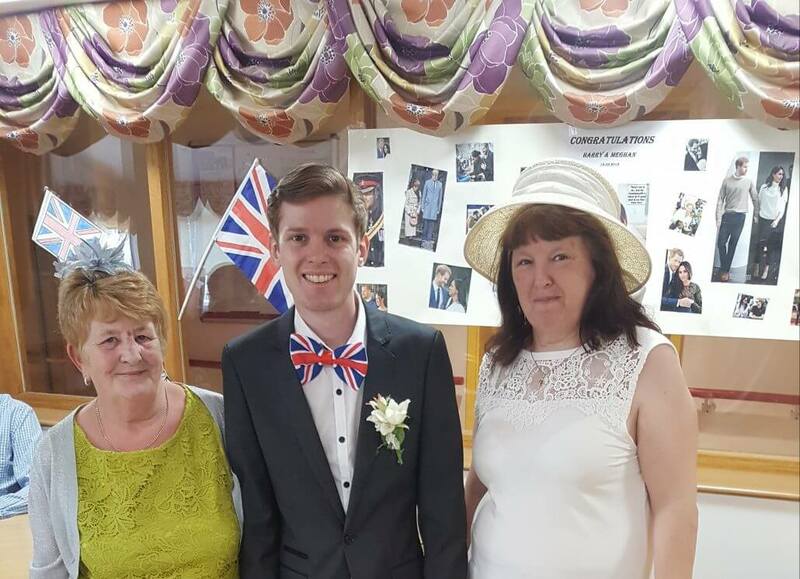 Most of our residents had a right royal time on Saturday 19 May, getting dressed up to the nines in their poshest outfits for the marriage of the Duke and Duchess of Sussex, and entering into the spirit of the day with great enjoyment. We watched the wedding live at noon, tucking into a delicious British buffet with a spectacular wedding cake as the centre piece, and then toasted the happy couple with glasses of bubbly. Chef Chris came in (on his day off!) to put the finishing touches to the wedding cakes (one each for Camelot House and Camelot Lodge) with cake toppers of the royal bride and groom, Meghan and Harry. The wedding cakes were made even more spectacular because they were surrounded by stunning ‘royal cupcakes’ made by a friend of Camelot, Kate Jenks, and our very own master cake-maker Niluh Chapman. Photo shows: (L-R) activities team members Angie Moore, Richard Dempslake and Kathy Burge.